Jemma Jane (Olive Neal) and the cast of Bullets Over Broadway. Photo by Matthew Murphy. 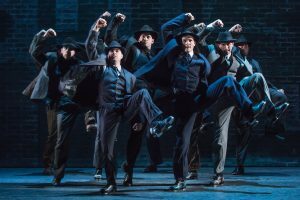 The 1st National Tour of the Tony-nominated musical comedy Bullets Over Broadway has landed at the Ordway. These performers are doing their best to dance, sing, and mug with everything they’ve got to get you your money’s worth. Read Basil Considine’s interview with director Jeff Whiting. The musical Bullets Over Broadway was written by Woody Allen – yes, that film director – and is based on the 1994 film that he co-wrote with Douglas McGrath. This story is set in 1929 and follows the hapless playwright and director David Shayne (played by Michael Williams)’s adventures in show business. Shayne finally gets his shot at the Broadway bigtime – but only if he casts the talentless Olive Neal (Jemma Jane), the girlfriend of the dangerous gangster Nick Valenti (Michael Corvino). Naturally, antics ensue with Valenti’s heavy Cheech (Jeff Brooks), who’s officially there to look after Olive but has a burgeoning talent all his own, and with aging theater star Helen Sinclair (Emma Stratton) driving Shayne to distraction. The musical numbers come from jazz and pop standards from the period, adapted and with additional lyrics penned by Glen Kelly. The direction and choreography are the real stars of the evening, both by Susan Stroman (Jeff Whiting, the tour director, was the Broadway show’s assistant director and has faithfully adapted both). This enticing movement is complemented by William Ivey Long’s sumptuous costumes and Jason Ardizzone-West’s colorful and dynamic scenic design; there’s always something beautiful and/or glittering to look at. The cast of Bullets Over Broadway. Photo by Matthew Murphy. Williams is a spark plug as playwright Shayne, moving from youthful exuberance and amusing artistic pretension to car-crash-so-bad-you-have-to-look nervous wreck. It’s certainly fun to watch as his play and delusions of grandeur collapse around his ears. His benign and long-suffering girlfriend Ellen (Hannah Rose Deflumeri) has little to do but take laundry on and off the line, but while she does so she shows off a clear and lovely singing voice. While the beautiful Stratton may seem initially miscast as the “aging” actress, she is statuesque and gloriously over the top with the warbling and overly modulated tones of an early-20th-century theater voice. Equally over the top and just as glorious is Jemma Jane as the no-talent Olive, finding new and interesting ways to grate on everyone around her and still get all the best gowns. Jeff Brooks as Cheech steals the show with his physical presence and killer dancing. The entire cast plays things to the hilt, and there is not a false note or false step in the bunch. The show itself is not as excellent as the people onstage to perform it. As a musical, Bullets Over Broadway is a perfect example of what people who hate musicals, well, say they totally hate about musicals. While the story seems like it would be ripe for the musical stage (a show about show business, divas and showgirls, danger! romance! ), Allen’s style of storytelling resists the format at every turn. The film version of Bullets was a set of quirky character studies and vignettes loosely connected by a simple plot. That’s a pretty typical recipe for a jukebox or songbook musical, and a format that can achieve no small charm or success—Glee and Mamma Mia seemed to do all right for themselves, didn’t they? It’s true that dozens of shows have repurposed a Gershwin song or two; shows built around preexisting songs are as old as the musical genre itself. One of the prototypical pieces of musical theatre, The Beggar’s Opera, regularly pinched songs and melodies from other hit shows of the time. This only works, though, if the characters and plot are generic enough to match the music…which Allen’s characters and story are not…or if the action and music make a clever juxtaposition or meaningful connection…which Bullets Over Broadway certainly does not. At their best, the jazz and pop standards that comprise this score almost match the action of the scenes they’re inserted to. All too often, however, they just don’t match the action – nor do they really reflect the particular characters singing them. (This was also a problem with Nice Work If You Can Get It last season.) Songs end up not furthering the plot, not aligning well, and don’t illustrate or enhance our appreciation of the idiosyncrasies of who’s singing them. Songs are also sliced up and interspersed with spoken dialogue, making many scenes feel like a fight between the story and the music, rather than a seamless connection of the two. Not only do the songs completely interrupt the flow of the scenes and the process of character development, the formula for trying to alternate generic lyrics and specific dialogue (dialogue, verse, verse, dialogue, verse, dialogue, chorus, transition to next scene . . .) becomes repetitive fairly quickly. In a way, the finale of “Yes, We Have No Bananas” is a fitting end – it’s full of big smiles and showcase opportunities for everybody to step forward and strut their stuff, and has nothing to do with anything. It’s an intentional musical non sequitur. I’m as much a fan of a pointless good time as anyone, so it’s a shame the show couldn’t just quit while it was ahead. The hints at anything deeper or more complex end up making things feel uneven and superficial when you try to follow the threads. 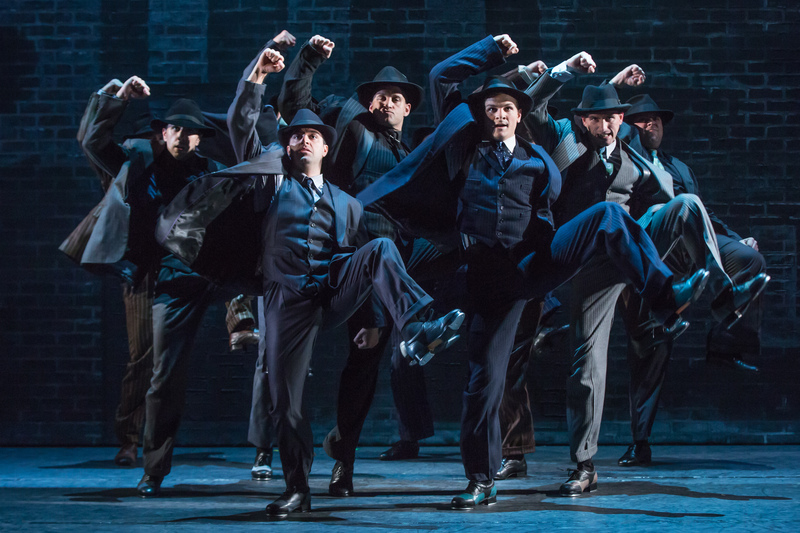 If you are looking for an evening of simple song and dance performed by people at the top of their game and dressed to the nines, Bullets Over Broadway should be a safe bet this weekend. If you like your songs to drive the plot and change the course of the narrative unfolding onstage, you might want to look elsewhere. Bullets Over Broadway plays through April 17 at the Ordway Center for the Performing Arts in St. Paul, MN.